Stop and let your mind wander for a moment. Picture pristine white beaches, serene Buddhist architecture and hear the somewhat soothing sound of buzzing vibrant Southeast Asian city life. Revel at the unfolding wonders, taking in every detail of Pagan’s plain of a thousand temples. Gaze in awe at the leg-rowing fishermen of Inle Lake, and stand, mesmerised by the glittering gold stupa of Rangoon’s Shwedagon Pagoda. After 50 years of oppression, Myanmar has opened its doors allowing curious travellers to take a peek into a world virtually unscathed by mass tourism. Untouched by globalisation and etched with glamorous colonial history, fewer places in the world resemble travel in a simpler time. One thing is certain, from the ground we can miss the scale and majesty of such mystical places. 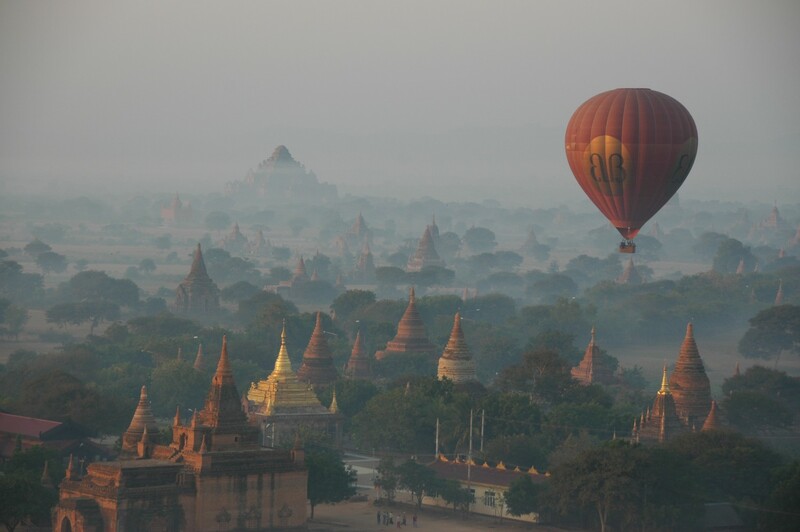 Glide through magical misty mornings by hot air balloon. Rest your weary head on the plush silky sheets of a teak four poster bed, placed neatly in your luxury lodge upon a sparkling lakeside. Let your incredibly knowledgeable guide traverse you across hidden landscapes as you gaze upon a million gold-spired temples, mastering and navigating secret routes to ancient ruins. Relax and reminisce over a candlelit dinner in front of a magnificently lit temple whilst sampling the local delight of spicy ăthouq. Take a privately chartered boat trip upon the Yangon River and step off the beaten track visiting rural communities rarely seen by many. End your day watching the sunset over the Ayeyarwady River with the cooling bubbles of champagne tickling your taste-buds. Expect to be dazzled by glowing cities of gilded temples dotted freely around their emerald green landscapes and humbled by the warm caring nature of gracious local villagers. Envisage peaceful pagodas, sacred sites, ancient towns and monasteries. With travellers now welcome here, the local community and the wonderful warmth of this magical place invite you into their world, proud to show you the place they call home. This is an adventure of epic proportions, of staggering beauty with terrain vastly unseen by much of the world. Perhaps you will come to understand and appreciate Kipling’s views of this mysterious land. Perhaps you may even be inspired to write a little poetry of your own. Would you like to know more? Or go somewhere a little different? With your spark of enthusiasm, your intriguing curiosity and your list of desires,simply tell us what you’re looking for. We’ll make it happen.